In the botanic garden Schachen (Garmisch-Partenkirchen) a new phenological survey program for a long-term monitoring will be established. It is part of a new European network of botanic gardens researching on the climate change impact on vegetation life cycles in arctic-alpine regions. In the short vegetation period the phenological behavior of ten native plants is investigated and a new helpful survey key will be provided. In addition phenological observations of montane tree species will be taken along altitudinal gradients and correlated to altitude and habitat characteristics. The actual and potential tree and forest line and their potential migration velocity will be investigated. Several databases and own measurements will help to find altitudinal shifts of seed production and germination capacity. The correlation of the vegetation period according to climate data sets with the real reaction of the plants on temperature leads to a migration trend of vegetation zones and tree line. The results also point to potential endangered species which have only slow reaction time or few retreat areas according to climate change. 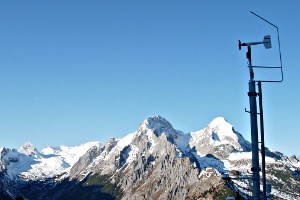 Another subproject investigates biogenic and anthropogenic sources of volatile organic compounds (non-methane hydrocarbons; NMHCs) that are important climate relevant ozone precursors, and their distribution under the influence of different meteorological conditions along altitudinal gradients in the Alps. The exact composition of these NMHCs provides important information on biogenic and anthropogenic emissions for the production of ozone, aerosols, and other photochemically formed compounds. It is important to understand the processes of formation and transport of those compounds in meteorologically and topographically complex systems. Most studies so far concentrated on metropolitan areas or airborne measurements in the free atmosphere. The behavior of NMHCs under different meteorological conditions along altitudinal gradients of 2000 m is still quite unknown. In the framework of the project impacts of long range transport, tropospherical background, and local emissions on the NMHC composition will be investigated in combination with other continuously monitored trace gases and aerosols. Thus, an apportionment and quantification of source contributions can provide important information on discriminating air masses originating from the atmospheric boundary layer, the injection layer, and the free troposphere. KLIMAGRAD is supported by the Bayerisches Staatsministerium für Umwelt und Verbraucherschutz.